Some become diplomats through birth. Others through dedicated education and focused study. A few geniuses, such as myself, achieve statesmanship (the ultimate diplomacy) through pure genius. I won’t give details and examples, Gentle Reader, for that would insult your intelligence. I am sure you are aware Prince Phillip interceded in certain tribal clashes in Africa between the Tu-Tu and non-Tu-Tu factions involving skull circumcision. And, of course men such as William F. Buckley, a learned scholar who graduated from Yale, resolved disputes between Russia and China over Perrier franchises. As a neighborhood diplomat, I stride in the shadows of these great men; and like my mentors, I believe that one reaches success only when a problem is solved in toto (Latin for: in toto). I am often called upon to resolve squabbles before hurtful things are said. Often I volunteer before being asked as I believe in making communities run smoothly. The following reflects one of my many methods of achieving a decisive conclusion in a neighborhood dispute, thus ending the kind of ongoing bickering that can lead to prolonged stress, disharmony, and stuttering. I employ each morning skipping along a delightful two mile road in one of the most bucolic and prosperous communities in California. Over the years I had become friends of both Morley and Mohammed. Two nicer chaps you could not find — one from Israel, the other from Iraq. One a Jew, the other a Muslim. Neither one overbearing or assertive. They lived in harmony, side by side, for decades. Except for that brief period in the 90s when they accidentally set each others’ houses ablaze three times. Each spoke (or when agitated, barked) in a fractured English which made it difficult for them to communicate with each other. That is where I, the diplomat and peace keeper, shone. Mohammed and Morley looked upon me as a friend who could nip disputes in the bud before they become magnified. (As a student of language, I spoke their respective tongues. And quite nicely I might add.) The result of my diplomacy exceeded even my expectations. A spindly avocado tree grew on Morley’s property. Its only branch hung over Mohammed’s property. The avocados that grew on the tree were on that single branch. 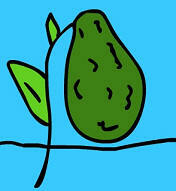 Morley would reach across the property line and pluck his avocados from his branch. Mohammed claimed the avocados over his property as his and harvested them for his use. Neither man was breaking the law but both men felt that all the avocados were his. Morley because it was his tree. Mohammed because the avocados were growing above his property. Nevertheless, even though Morley and Mohammed were well-armed, a tense situation escalated. I waited until both men departed for a week-long trip and then I picked all the avocados. I mailed a well thought out letter to each man detailing what I had accomplished and promised I would divide the avocados, awarding each man his just share. Both Mohammed and Morley arrived at the airport to discover that all flights were cancelled for 24 hours due to a security threat. 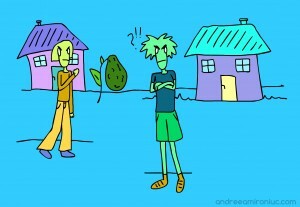 The two returned to their respective homes and seeing the avocado tree stripped, each accused the other of fruit theft. Tempers flared. Weapons were displayed — a warning shot was fired — the police rushed to our neighborhood. Now Morley, Mohammed, two policemen and the mailman are dead. The avocados are excellent! It is obvious why both Morley and Mohammed prized them. We will all miss these two gentle creatures who advocated fresh fruit, vegetable diets, and recycling. The neighborhood is tranquil. Note: If you are bickering with a neighbor or loved one, please contact me. I stand ready to assist. And here is my latest novel. It’s about a religious nut. Me. Click one of the above to see some of my work.